On Wednesday night, Feb. 22, while packing suitcases for a weeklong trip to Nashville and Memphis, my partner, Greta, and I found a letter inside a baggie attached to the front door of our Dana Point home. It was written by a 5-year-old boy named Cash. He is the son of our neighbors, Cody and Victoria, who live across the street. When we first met them, they told us their son was named Cash and their daughter was named Waylan Jane. “Because we love Johnny Cash, Waylon Jennings and country music,” they said. They were surprised when I told them that I worked with Johnny in 1975 and 1976, and had been friends with him. Cody and Victoria knew that their son Cash, a huge Johnny Cash fan, would want to send a letter to Johnny and wanted to know if we would hand-deliver it for him. Of course, young Cash didn’t comprehend that Johnny and his wife, June Carter, had both passed away in 2003. We said we would somehow get the letter to Johnny, in one way or another. The trip was the first time I had been to Nashville since 1976, when I co-produced an album of train songs with Johnny at his recording studio in nearby Hendersonville. In Nashville, after a visit to the Ryman Auditorium, home to the Grand Ole Opry from 1943 to 1974, we walked to the Johnny Cash Museum. I wanted to meet the museum founder and owner, Bill Miller, to give him a copy of I book I wrote, titled Prime Rib & Boxcars. Whatever Happened to Victoria Station?. The book features the details of when I worked with Johnny and has a picture of Johnny and me on the front cover. While waiting to meet Miller, the four of us took the museum tour. And that is where our young neighbor Cash’s letter was delivered to Johnny. Later, we met Miller. He was most gracious and gave us a tour of the soon-to-open Patsy Cline Museum, which is located on the second floor above the Cash Museum. He also invited us to a private Johnny Cash birthday party for the following day. The next morning, we visited the Country Music Hall of Fame. The highlight: the rotunda where each of the 130 Hall of Fame members have plaques on the wall. From there, it’s a short walk to the Johnny Cash Museum. We spent time with W.S. Holland, Johnny’s only drummer. I had known him when I worked with Johnny. And since he is mentioned in my book, I signed a copy for him. We enjoyed attending the birthday party for Johnny in a private room. That night, we went to the Grand Ole Opry and enjoyed a backstage tour during the concert. We saw Vince Gill practicing his guitar in his dressing room before his appearance and watched a part of the show from behind the stage. There were nearly 20 performers that night, making it a stellar evening. On Sunday, we drove 212 miles on the “Music Highway” to Memphis, where we visited Graceland, the home of Elvis. I recalled, while listening to Detroit’s WJR radio in 1956, saying to my brother, “I just heard some singer named Elvis sing a song called ‘Heartbreak Hotel,’ it’s going to be a huge hit.” So, being with brother Bill at Graceland 61 years later was very nostalgic for me. Our trip concluded with a visit to Sun Records in downtown Memphis, where Sam Phillips launched the careers of Elvis, Johnny Cash, Carl Perkins and Jerry Lee Lewis, also known as the Million Dollar Quartet, and many others. It was special to stand in the very spot where Elvis recorded his first song and to hold the microphone he used. And to hear the very first recording of Johnny Cash’s “I Walk the Line,” gave me goosebumps. Our trip to Tennessee was a success. We delivered our young neighbor Cash’s letter to Johnny. 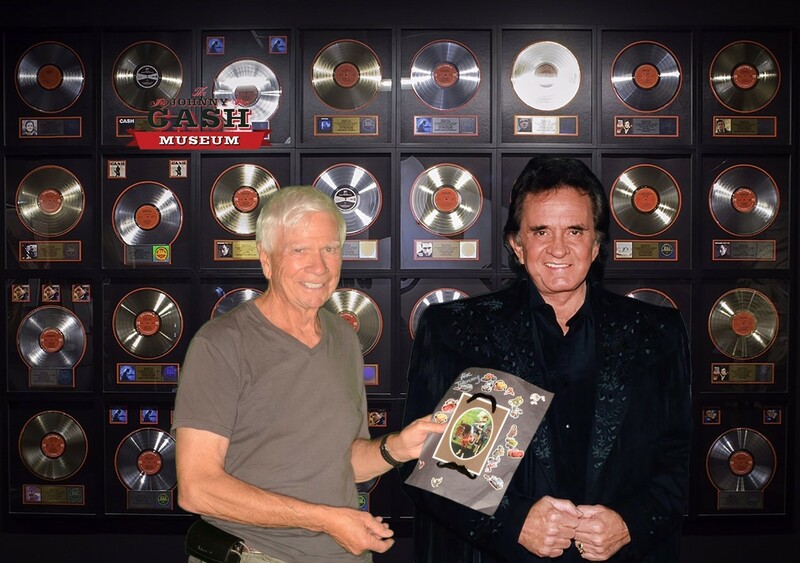 And Bill Miller said the Johnny Cash Museum would carry my books in the gift shop. That made me very happy. Be sure you visit the Johnny Cash Museum and Sun Records when you travel to Tennessee. Tom Blake is a Dana Point resident and a former Dana Point businessman who has authored several books on middle-aged dating. See his websites at www.findingloveafter50.com; www.vicsta.com and www.travelafter55.com. To receive Tom’s weekly online newsletter, sign up at www.findingloveafter50.com or email at tompblake@gmail.com.